I never make New Year's resolutions, but this year I did make a few cooking and blog goals for the year (like going through my massive stack of food magazines and either throwing them out or actually cooking the recipes in them!). One of my blog goals was to try to post more easy, weeknight meals, which I feel like my blog doesn't have enough of. I think I usually assume people wouldn't like recipes that appear too simple, but in reality, that's what the majority of working/busy people need, right? This pasta dish is one of those recipes that proves that simple recipes (with the right ingredients) often make for the best meals. Homemade pasta sauces always taste so much better than the storebought kind, and this sauce couldn't be easier, with the standard onions, garlic, diced tomatoes, and crushed tomatoes; but the addition of antipasto really boosts the flavour. Adding in some tuna for protein keeps the dish quick and easy, and a sprinkle of fresh parsley at the end keeps it fresh and flavourful. Ryan and I both loved this pasta and can't wait to eat our big batch of leftovers over the next couple days! The recipe can be found over at Aurora Importing's site here. Like the delicious pea risotto I made a couple weeks ago, this recipe is part of Aurora Recipideo contest. Each month, they feature a different recipe made easy with the use of a short video to show how it's made. Then you can make the recipe yourself at home, take a picture, and enter it to win a $50.00 gift certificate to My Italian Cantina, an online store where you can purchase a variety of Italian and European products. 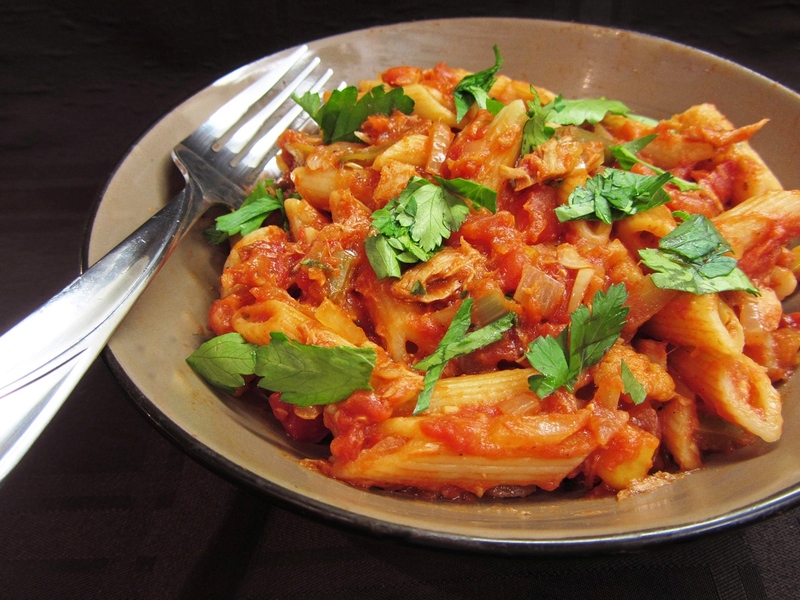 This month's Recipideo for this spicy tuna pasta (along with the contest details) can be found here. Keep in mind that you can add your own personal flair to the dish to make it your own! I changed a few things with my dish, like using a lot more antipasto, and adding some hot sauce and red pepper flakes for extra spice since the antipasto I used was on the sweet side. Not only can you all enter Aurora's Recipideo contest for the chance to win the $50.00 gift certificate, but the generous folks over at Aurora have also been kind enough to offer one lucky reader the chance to win the products featured in this recipe! One randomly selected winner will be sent the following products (all of which can also be purchased from My Italian Cantina), worth over $20 total. You can use them make this spicy tuna pasta or your own creative dish! If you don't have a blog or account anywhere, don't worry, you can still enter! When posting your comment, select the "Name/URL" option for "comment as", fill in your name, and leave the URL field blank. Easy peasy! This giveaway is open only to those with Canadian shipping addresses (sorry, American and international friends, I hope to have more giveaways in the future that will include you!) Americans are still welcome to enter the Recipideo contest though, so you're not left out! The contest closes Thursday, January 12 at midnight EST, when I will use a random number generator to select the winning comment. I will post the winner's name on the blog Friday morning and the winner will have 24 hours to contact me with their shipping information. So be sure to check back here on Friday the 13th to see if you won, and use the buttons on the sidebar to subscribe to my blog feed so you don't forget! Good luck! The giveaway is now closed. The winner has been announced here. Thanks again to all those who entered! Hey! My italian roommate in Geneva made something similar, but he included black olives. He also only added crushed tomatoes and no other tomato products and used rigatoni instead of penne. He also said wonderful things like pasta and sauce and like man and woman, they are meant to be together! My Nonnas pasta sauce will always go down as my favourite! I think my favourite Italian dish is the simple, yet delicious spaghetti with meat sauce. I liked your Facebook page and I love your blog. So cool Nat! Mmmmm I always love a good Caesar Salad made from scratch. The key is anchovies, fresh parm & lots of garlic! Love your blog Nat. Great recipes! When it comes to Italian, it's difficult to pick a favourite because there are so many, but the ones that come mind are Chicken Marsala, Pasta with Pesto and just about any tomato sauce made with fresh tomatoes from my garden. I wasn't going to reply to any comments because my own comment would get counted whenever I use the random number generator to choose a winner, but I have to at least say thanks to everyone who has entered so far for your comments/facebook likes! You're all putting so much thought into your favourite Italian dishes and I love reading about them :) To everyone else, keep the comments coming! And to those who have already commented, remember you can have up to 2 entries! This is am making this for supper tonight. Love to find another canadian blogger. great post; I was contacted my Aurora and made that great 18 min Risotto; my post for next Monday; going to check out your FB page. Chicken marsala is my favorite. I made the spicy tuna pasta last night and it was awesome! love your blog and i liked your facebook page. Keep up the great work!! I'm having a hard time thinking of an Italian dish that I enjoy more than a stack of home-made lasagne. My favorite Italian dish would have to be a classic meat lasagne, oozing with lots of mozzarella and bechmel sauce. I think Penne alla Vodka would have to be a very close second. BTW, I made my way over to your blog via Food Network, you have some really great photos and recipes. I'll be visiting more often. Ok, here is my second (slightly guilty) favourite...Carpaccio de boeuf! Years ago I discovered a pasta e fagioli dish in an Italian cookbook. I made it for my Italian husband and he loved it. It has since become a winter staple in our house. Recently I've been making it without the pasta, freezing it in batches, then pulling it out when I want it and adding the pasta when I heat it up. Stupendo!! I made this once for a Sicilian friend, who could not stop raving about how much it tasted like his 'mamma's'. I crave food like that all the time in the winter .. And now you just made me crave that dish, I might have to make it soon! My favourite dish would have to be a simple gnocchi with tomato sauce - yum! My favorite Italian dish is garlic fettucine alfredo with strawberries...sounds weird, but it's delicious! White cheddar mac and cheese is also right up there. And stuffed shells. Oh man, I'm getting hungry! I would love to go to Granville Island just for the beer alone, but butternut squash gnocchi definitely sounds worth the trip too! I like your FB page. This is my first time here and I'm enjoying walking through the site. Thanks! hmmm ... favourite Italian dish? Would have to be lasagne. Although I did have a nice Italian sausage, broccoli, tomato, basil pasta with a wee bit of sauce. I love risotti but am too chicken to try making it myself. But I see Eoin's post that it's easy ... may just have to make it! Hi Evelyn, unfortunately the giveaway contest is closed now, but I appreciate your comments and you stopping by! I was always too scared to make risotto too but just made it for the first time recently (see my recipe for risotto with peas) and it was so much easier than I thought! You should definitely try it!